51 Rules to Become Your Own (S)hero. Write Your Own Rules, Build a Body You Love, and Live an Awesome Life. There’s no shortage of rules in the health and fitness world. Heck, I’ve created some such as the 6 (Sane and Simple) Rules to Lift Like a Girl, Get Results, and be More Awesome, among others. But while I think it’s terrific to look to others you trust and adopt some of their rules, I think it’s equally important to write your own set of rules. Specifically, when it comes to building the body you want, you need to do what makes you feel best. Set your own standards and don’t blindly follow fads or strive to achieve the look “they” say you should have. I call this becoming your own (S)hero, or for men, hero. Let’s define this whole Become Your Own (S)hero thing first. What does that even mean? For one, oftentimes we get in the trap of comparing ourselves to others. Be it super models, athletes, friends, actresses, fitness experts, or anyone else, we fall into the trap of comparing ourselves to those individuals. Heck, I’ve been guilty of this myself in the past. I constantly compared myself to other women, and as a result I never felt good enough. I always felt like I needed to improve something and that I was falling short and didn’t look, eat, or workout like I “should”. 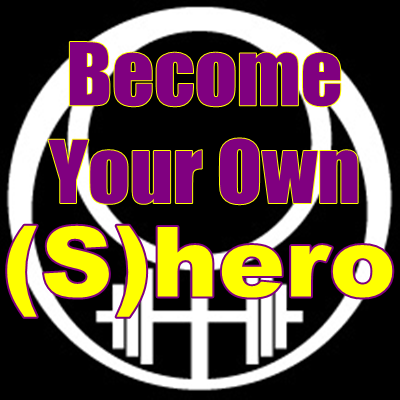 Becoming your own (S)hero in regards to the wonderful journey of health and fitness means writing your own rules. Sure you can use some tried and true rules, many of which are on this website, but you should sprinkle in a mix of rules that are unique to you, your goals, and your personality. It’s about building the body YOU want. It’s about achieving the look and physique that makes you happy, regardless of what the critics say (and, believe me, there will always be people who give you crap no matter what you look like). It’s about being proud of what your body can DO. It’s about no longer needing or caring about the opinions of other people to validate your success. It’s about building a body you’ll love and living an awesome life. It’s about being your own (S)hero. The following is my list of rules I live by to build a better body, enjoy life, and to become the most awesome and strongest version of myself. Some I’ve mastered, and others I have to work on every day. But these rules are helping me live a life I absolutely love. Keep in mind these are my rules. While I’m sure we’ll have several in common, I encourage you to write some of your own. 1. Eat food that not only tastes awesome but makes me feel great. 2. Reduce or eliminate foods that don’t make me feel awesome. 3. Enjoy my favorite not-so-healthy-but-OMG-they’re-tasty foods and treats when I really want them. Absolutely guilt free. 4. Try new things. This one goes for food (I’m a foodie and will try almost anything), with my workouts, but also in every other area of my life. You never know how awesome something may be until you try. Sure, some things may be horrible, but you may discover something amazing. Either way, you never know until you try. 5. Moonwalk, often. (I’m certain this skill was a contributing factor to winning over my better half. I believe this is scientific fact: moonwalking elevates your awesomeness factor by at least 85.3%). 6. Don’t be afraid of failure. Failure is a part of life. But, what matters is what you do after you fail. Learn what you can, and become better because of the experience. Failure is an opportunity to come back stronger and more knowledgeable. 7. Don’t stress over the little things. If you can’t control a situation, stressing over it is useless and wastes energy. 8. Clear out your e-mail inbox. If you’re subscribed to a list or source that you don’t read often or benefit from in some way, unsubscribe. The Lift Like a Girl newsletter is no exception; if you don’t enjoy or benefit from the information, then unsubscribe. Less clutter in your inbox is a very good thing, and you shouldn’t waste your time on sources that don’t add value to your life. 9. Be the change you want to see in others. 10. Don’t wait for a “holy crap!” moment to make a change. Some people don’t make a lifestyle change until they have a heart attack or get bad news at a doctor’s visit. Likewise some people don’t realize what they had until it’s gone. Cherish those you love, take care of yourself, and make the most of every day. 11. Use the exercises that work best for you, at any given point. Don’t force yourself to perform exercises A, B, and C if you can’t perform them without discomfort or proper form. 12. Challenge yourself — mentally and physically. This will help you grow, and growth is important. 13. Shrug off the not-so-good days. Focus on what matters most, and move forward. 14. When I need to reset my workout routine, few things prove to be more effective than three total body workouts per week with a nice leisurely walk on non-lifting days. 15. Your journey to building the body you want should be about consistency and not perfection. Follow the basics, consistently, and have built-in flexibility. 16. Always have positive, motivating goals. For example: choose to focus on getting stronger instead of losing five pounds. 17. Don’t be afraid to try something new. To an extent I agree with the expression. “if it ain’t broke, don’t it”, but what if you could do something a little bit better? You don’t know until you try. 18. Your self-worth, success, and value as a personal cannot be defined by numbers. Avoid any source that attempts to tell you otherwise. 19. Know your values, and be unwavering. 20. Enjoy the simple things like a delicious meal, fresh brewed cup of coffee, bowl of ice cream, or glass of wine. Savor it. 21. When in doubt, read more books. 22. For everything in my life — business, working out, having a successful marriage – I like to have a few basic rules. Focus on the few, but important, things that provide the majority of the results. This always produces better results than trying too much all at once. 23. Remove all clutter, even from closets, drawers, and cabinets. By most people’s standards I’m a minimalist, but we’ve been slowly going through everything we own. If we don’t use it frequently or it doesn’t add value to our lives in some way, we give it away or sell it. 24. Spend your time and energy becoming better and more awesome for the people you love and who love you instead of trying to convince others to like you. You will always have people who don’t like you, for whatever reason. Don’t worry about it. 25. Have a few close friends you can rely on to be brutally honest when necessary, and kindly return the favor. 26. Identify sources of negativity in your life, and remove them. Negativity is contagious, so avoid it. 27. Spend more time in nature. 28. Always look forward when you walk; never look down. 29. Value few peoples’ opinions about you and stop caring about what other people think. Plenty of people will be cruel or hateful, so only care about the select few who truly matter. 30. Put things in perspective. Sometimes what you think is a horrible situation, in reality, isn’t that bad. 31. Strive to have good days and great days only – save “bad days” for the truly unavoidable realities in life. 32. Don’t be afraid to listen to your body and practice intuitive strength training. It can be even ore beneficial as you get stronger and older. 33. Focus on your actions in order to reach your goals; these can be tracked and measured. 34. Increasing your physical strength can have a profound affect on your entire life. When in doubt with what to focus on with your workouts – get stronger. 35. If the number on the bathroom scale can negatively affect your mood, stay off the scale. 36. Simplify everything. Focus only on the few essentials that produce the desired result. This is the 80/20 principle, and it can apply to practically everything: 80 percent of the results will come from 20 percent of your efforts. 37. Don’t buy things that don’t truly add enjoyment to your life. 38. Get out of your comfort zone. 39. Have as many new experiences as possible. Make wonderful memories that can never be replaced or taken away. 40. Don’t be afraid to say “no”. 41. Lifting Like a Girl isn’t just about working out. It’s a manifesto for life. 42. You have experiences and knowledge that are truly unique. Use them to help others. 43. You are already awesome. The goal, then, is simply to become more awesome. This is especially important when you embark on a health and fitness regimen. 44. Ask “Why?” more often. Why does someone recommend eating a certain way? Why does someone use a particular workout method? Why does someone tell you to “eat this food” and “don’t eat that food”? Question more often, including what you read on this website. 45. Any time you want to lose body fat, do not look for a rapid fat loss methods. Those ingrain bad, unsustainable, frustrating habits. Instead focus on the simple things that provide the best results. 46. When it comes to nutrition, flexible guidelines are better than diets or meal plans. 47. Marry your best friend. It always made sense to me that if I was going to get married, I should marry my best friend. I had the honor and privilege of making this a reality almost two years ago. It’s been an exciting, magnificent, and wonderful journey. 48. Own less. Do more. 49. Time is our most precious resource. We should spend it wisely. 50. Have fun, every single day. Don’t let a day go by without doing at least one awesome thing. Make an effort to play more and work out less. 51. Be present. Whether you’re having a conversation, eating a meal, working out, reading an article (*hint-hint*) or walking around your neighborhood — be present. Immerse yourself completely in the moment and experience. You just read some of my 51 rules to become my own (S)hero and live an awesome life — now it’s your turn. The goal of this article was not to convince you to adopt my set of rules. I’m sure we have some in common, but I encourage you to come up with some that are unique to you. Become your own (S)hero — love your body and live an awesome life. If you think joining the Lift Like a Girl newsletter could benefit you and help you become your own (S)hero, then subscribe below to receive blog updates, insider information, and a free gift.